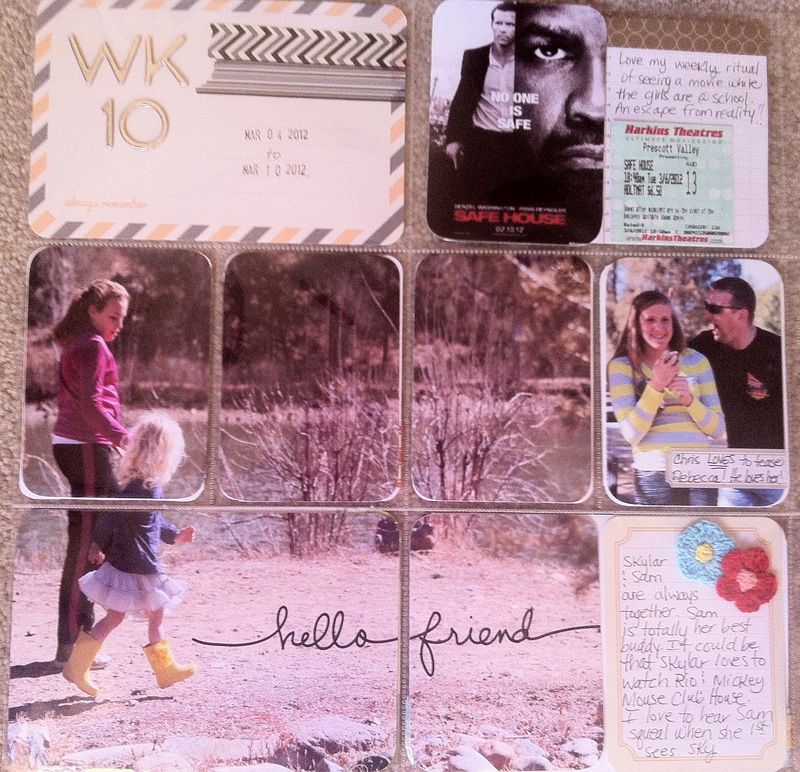 Project Life: Week 10 | I am JuJu! It’s that time again! 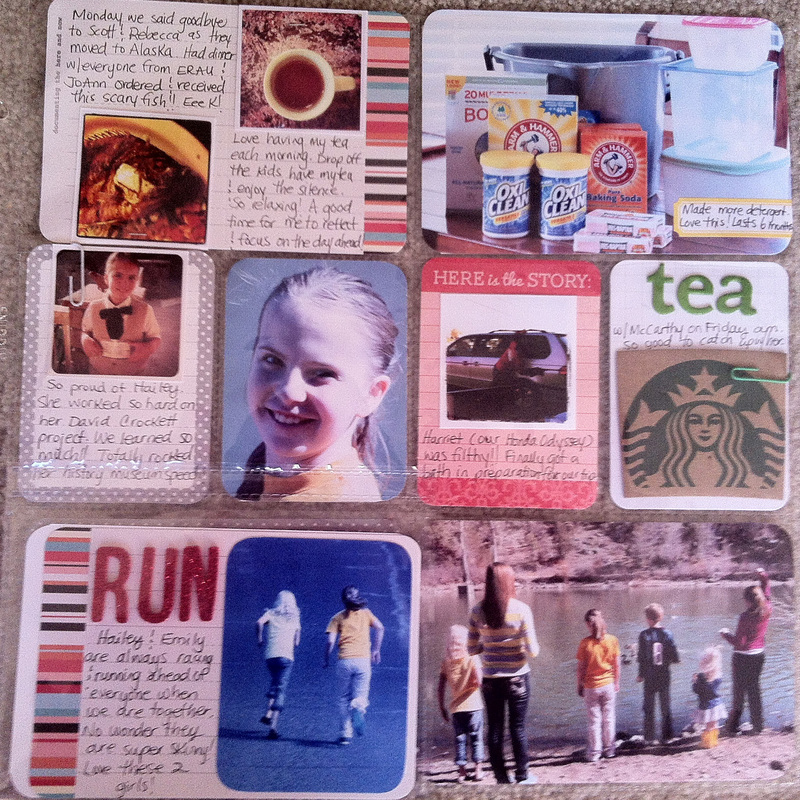 I had fun working on my project life pages this week with my sister who came up for the weekend. It was fun to have a partner in crime. I’m going to hop right to my pages this week as we are currently spending some time at the “happiest place on earth”! So excited to have a few days away thanks to a fabulous military special on 3-day park hopper passes & my folks who gave us a ton of Hilton points! Below is a view of my pages with an envelope insert that I included this week. Skylar had a really tough day on Thursday and I wanted to share some of my thoughts about it privately. Here is a view without the envelope insert. I kept it pretty simple this week. We left on Sunday for California so I knew that I needed to get it done & photographed. Here is the left page. My sister came up to Prescott on Saturday afternoon & we took all the kids up to feed the ducks. I took my good Canon dslr camera & just snapped away. When I uploaded the pictures and saw this one of Skylar & Sam, I knew that I wanted to do another enlarged photo like the one I did here. I added a simple digital element by Ali Edwards. Here is a closer look. 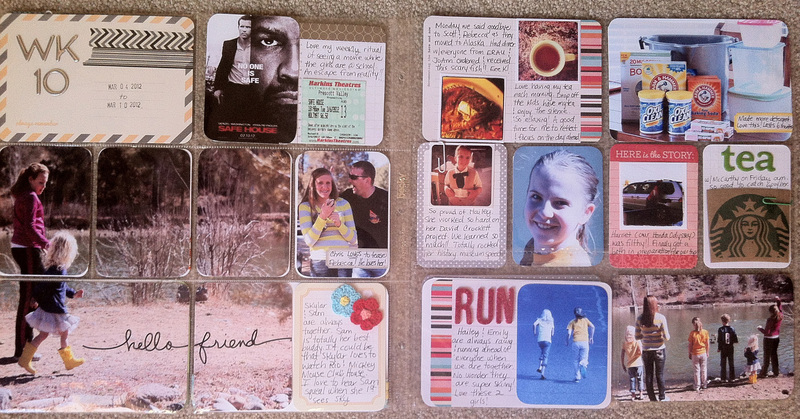 Here is the right side of the layout. Here is a close-up view of the flip-up protector. Hailey worked on a project about David Crockett for several months and this past week everything was due & she performed her speech for the Living History Museum. It was really neat & I was super proud of her. Well there you have it! As always I appreciate any comments & I’m happy to answer any questions you might have. Gotta run as the kids are practically pulling me out the hotel room door to get back to the park! This entry was tagged documentation, everyday life, memory keeping, project life week 10. Bookmark the permalink. I absolutely love the stories your pictures tell and how you arrange them. The “Hello Friend” shot is an eye-catcher. I’ve always wanted to make my own soap too. It looks like a pretty good week. 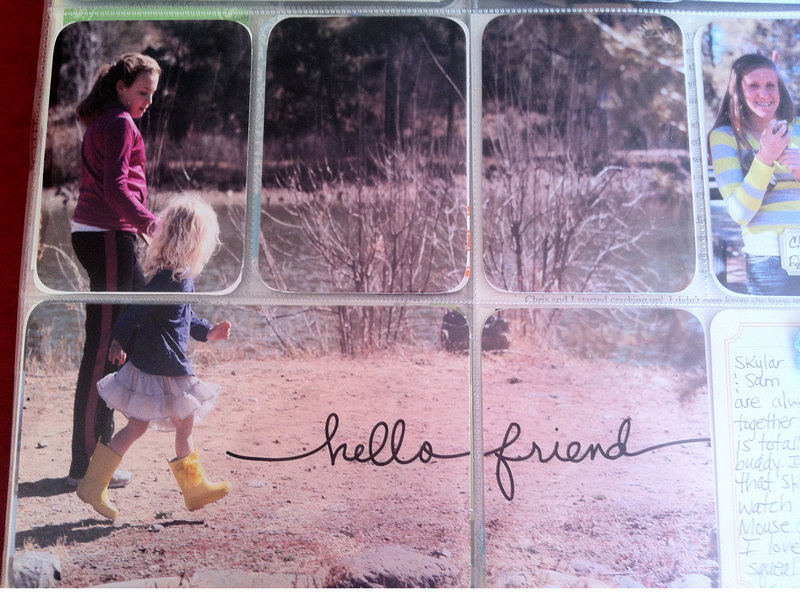 I just love your HELLO FRIEND enlarged photo. It adds such interest to your whole layout. Love. Love that you make your own soap. I keep thinking about doing that but have yet to take any action… maybe someday. As always I just love your pages, so fun to look at. So inspiring and give me some ideas every week (even if I don’t always implement right away). Always appreciate how good YOU are to leave comments. So encouraging when people stop over and look and actually comment too. 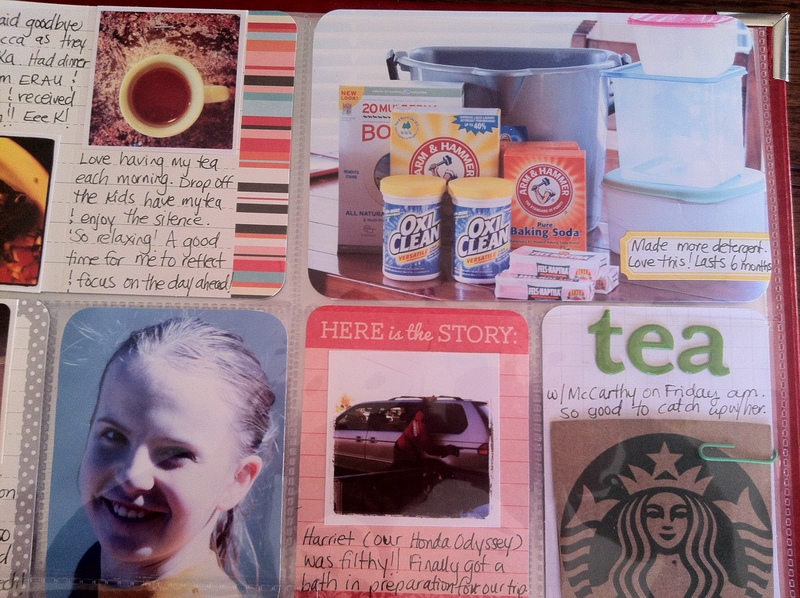 I love seeing your pages every week – full of PL goodness! That enlarged photo is so engaging! SImple and classic, with so much emotion. 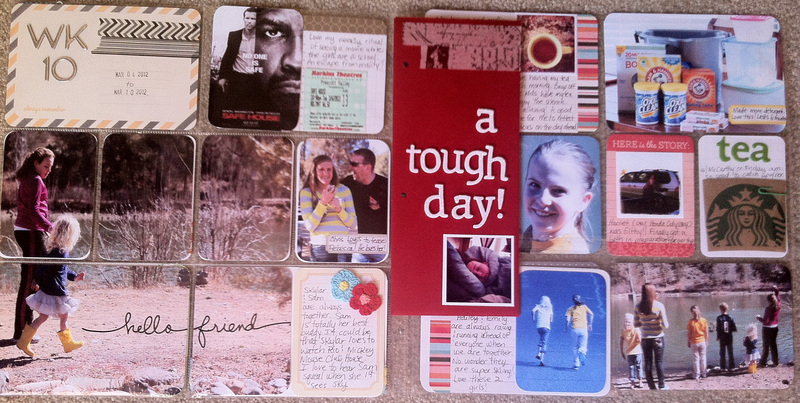 The flip up protector is great too – I must try this – thanks for the idea! love all the little details and novel touches. 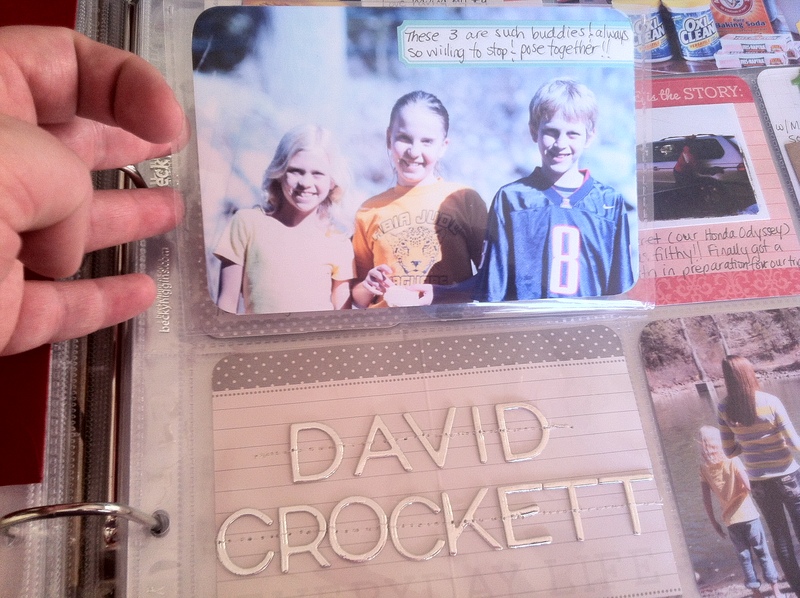 i also included an insert about a ‘difficult’ topic this week – great that PL can be used to store the good, and the not so good, memories and happenings…..love your pages. thanks so much for sharing. fantastical…like everyone else love the enlarged photo…I did that this week using an A protector and two 6×8 photos…just adds something great! hope you have the best time on your trip! LOVE, love, love that photo enlargement. I am going to try to do that in my album. LOVE the enlarged photo! I’ve seen a few people do this, and I’m really wanting to give it a try. Thanks for the inspiration! Your big picture is so stunning in the page! What a great week! I just started PL last week and am overflowing with ideas and constantly searching for more. I love your style and especially the enlarged photo. I was just wondering if you have any suggestions on an easy way to do it as I don’t have internet (I use my phone) or a home printer.